Bio Notes: Edward Grigg Wylie was born at 12 Raeberry Street, Glasgow on 11 April 1885, the son of Robert Wylie, commercial traveller and brush manufacturer and his wife Agnes Robinson Grigg. 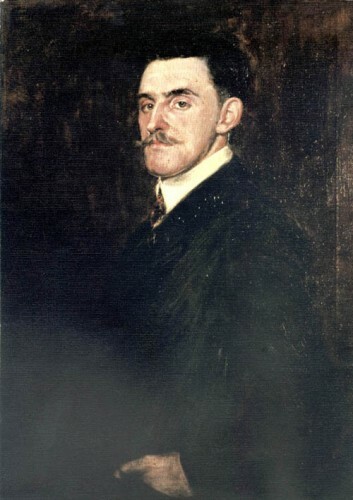 He was articled to William Forsyth McGibbon from 1900 to 1905, during which period (from 1901) he studied at Glasgow School of Art and the Glasgow and West of Scotland Technical College, and from 1904 at the Glasgow School of Architecture where he took the full-time course and became close to Eugène Bourdon. At the end of his apprenticeship in 1905 he won the RIBA Silver Medal and the following year took up a place in the office of John Burnet & Son. During his time as apprentice and assistant he undertook five sketching tours in England and France, each of one month's duration. In 1909 Wylie commenced practice on his own account, Eugène Bourdon having appointed him as a part-time instructor at the Glasgow School of Architecture. In 1911 Wylie entered into partnership with Alexander Wright. The practice was closed during the First World War. Wylie served with the Durham Light Infantry and was several times mentioned in despatches, gaining the MC and bar; he was also made a Chevalier of the Order of the Crown of Rowmania [sic]. The partnership with Alexander Wright was resumed in 1919. Wylie was appointed an instructor at Glasgow School of Art under Alexander McGibbon in that year, and was admitted ARIBA under the war exemption scheme in mid-1920, his proposers being Sir John James Burnet, John Keppie and Thomas Lumsden Taylor. He was then appointed Professor of Architecture and Head of Glasgow School of Architecture in succession to Eugène Bourdon whose post had remained vacant since his death in 1916, but resigned in 1921 after only a year because of his fast growing practice. In 1927 the practice moved to larger premises at 204 West Regent Street, business having grown enormously as a result of the competition wins for Hillhead High School and the Scots Legal Life Building. In 1928 Wylie's nephew, Frederick Robert Wylie was taken into partnership, the practice title now becoming Wylie Wright & Wylie, the changed precedence reflecting Wylie's leading role as both designer and job-getter. The partnership with Wright was dissolved in 1935 by mutual agreement. Wright recognised that by both age and temperament he was no longer suited to the fast-changing nature of the practice, and set up his own which tended to specialise in alterations and additions rather than new buildings. In the following year Wylie took George Ferguson Shanks into partnership, the practice name becoming Wylie Shanks & Wylie. In 1937 Wylie was appointed chief consulting architect to Scottish Industrial Estates Ltd and from that year onwards designed many of their buildings. In his Fellowship Nomination Paper he states that he was involved with schemes for the Scottish Industrail Estates to the value of £20,000,000. Not long thereafter he also became architect to Scottish Oils and Shell Mex Ltd. By 1947 the practice also acted as architects to Glasgow Royal Infirmary and the Clydesdale Bank. In 1946 Walter Underwood was taken into partnership, the firm name becoming Wylie Shanks & Underwood after the death of Edward Grigg Wylie in 1954. In 1949 Wylie was appointed OBE for his services to the Scottish Industrial Estates Company. Wylie died of a cerebral thrombosis at his home, 8 Queensborough Gardens, Glasgow on 31 August 1954 on the eve of the opening of the Scottish Industries Exhibition at the Kelvin Hall for which he had been largely responsible, Lord Bilsland paying tribute to his memory. He left a widow, Elizabeth Wyper Forsyth and the then substantial sum of £48,562 11s 5d. 1929 Lennox Castle Lennoxtown Stirlingshire Scotland Conversion of Lennox Castle into nurses' home, and addition of numerous blocks on the estate to form hospital. Also extensive buildings for a theatre/cinema in hospital grounds proposed. 1934 Wylie & Lochhead's Glasgow Scotland Warehouse (behind main building?) This is the address given in 'Architect & Building News'. 1935 Cathkin Braes Golf Clubhouse Cathkin Braes Lanarkshire Scotland Complete rebuild? Before 1947 Rutherglen Town Hall Rutherglen Lanarkshire Scotland Scheme for restoration - or proposal for new building?